There can be no more personal tribute to a beloved pet than a photo frame urn for ashes. This homage allows you to pick your favorite pictured moment with your furry friend and memorialize it, to keep you company and bring you comfort for years to come. The silver finish provides a beautiful framing for a precious picture that commemorates a life lived well. Whether you decide to keep it in your office or at home, it will keep their memory close to you and remind you of the fun times that you shared. 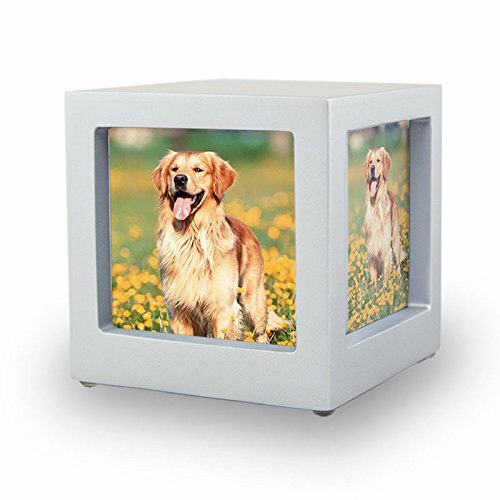 Should you wish to add an even more personal touch to this photo cube urn, you can add an engraving, to commemorate your beloved pet exactly how you wish to. MDF is a mixture of wood and resin to give the final product many advantages. MDF is strong and resistant to warping or cracking and thus longer lasting than many other wood products. The surface of MDF is very smooth making it much easier to beautifully paint or to add veneers. Also MDF is very affordable. A regular wood urn box of this quality could easily cost several hundred dollars more. Photo cube cremation urn for pets with a lustrous silver paint finish. Frames built into 3 sides of the cremation urn. Dimensions: 5.50 Inches High, 4.80 Inches Wide. Capacity: Ideal for a body weight of up to 45 pounds prior to cremation. Engraving available. Please enter B07CHXXXGW in the Amazon search bar to find the engraving product. Provide engraving details after selecting CUSTOMIZE NOW.